Whether you call it a spice, herb or vegetable, garlic is one of the easiest crops to grow. There are many kinds of garlic, but they either fall in the “softneck” or “hardneck” variety. Softneck garlics are softer, have papery white shells and stay fresh longer than hardneck garlics. Hardneck garlics have harder necks, larger cloves and little to no outer papery layers. Whichever type you are growing, the planting time is one of the most important factors in determining the quality and size of your crop. While it may take some trial and error to figure out the best time to plant garlic in your garden, you should still reap a usable harvest the first year. Purchase your garlic from a local nursery, catalog or online nursery center. Choose garlic that is rated to your specific USDA plant hardiness zone. Garlic bulbs that you buy at the grocery store (which are the softneck variety) may grow well if you live in zones 9 and warmer, but not likely in cooler zones. Cultivate the soil by loosening it with a tiller to a depth of about 6 inches and mix in 3 lbs. of 10-10-10 fertilizer for every 100 square feet. For clay soil, mix in 3 inches of compost or well-rotted manure to help create a loamy soil more suitable for growing garlic. Time your planting. 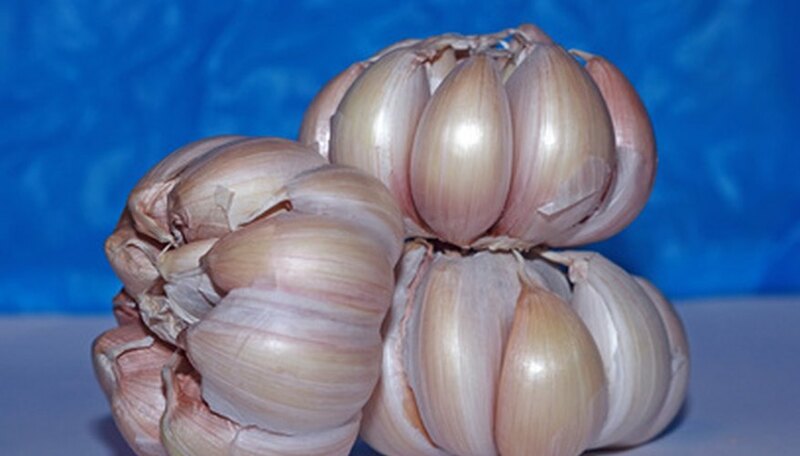 Hardneck garlic bulbs need at least eight weeks of chilling time in order to grow. In cooler zones such as zones 6 and colder, hardneck garlic bulbs are best planted in the fall, usually in October or November (about four to six weeks before the ground freeze), but can be planted in the early spring after the ground as thawed. In warmer zones, such as in zones 7 and 8, plant your hardneck bulbs just before the coldest part of the year, usually in December or January. In zones 9 and warmer, either plant softneck bulbs in the spring or refrigerate hardneck bulbs for eight weeks in the winter and plant them in the spring. Separate the garlic bulb into cloves just before planting. Plant each clove 1 ½ inches deep with the tip facing up. Space each clove 3 to 5 inches apart and space more than one row of garlic 18 to 30 inches apart. Water the newly planted garlic with an inch of water. Then, continue to water it on a weekly basis beginning in the spring when new growth appears. Water the garlic with 1 inch of water only when rain does not meet this requirement. Cease watering two weeks before harvest time, which is usually sometime between mid-summer and early fall, depending on your climate. Harvest garlic by digging it up (with the foliage still intact) when the foliage begins to yellow. Then dry it for two to three weeks in a warm, shady and well-ventalated location. Cut off the foliage to just an inch above the bulbs and store the garlic in a mesh bag in your refrigerator for use. Softneck varieties will store for about six months, while hardneck varieties will store for about three months.